Is there anything more completely comfort food than supper out of a bowl? I DON’T THINK SO. And while I do love bowls full of soup and oatmeal and pastina with egg and cheese, my most recent supper in a bowl crush has been this sesame salmon rice bowl. 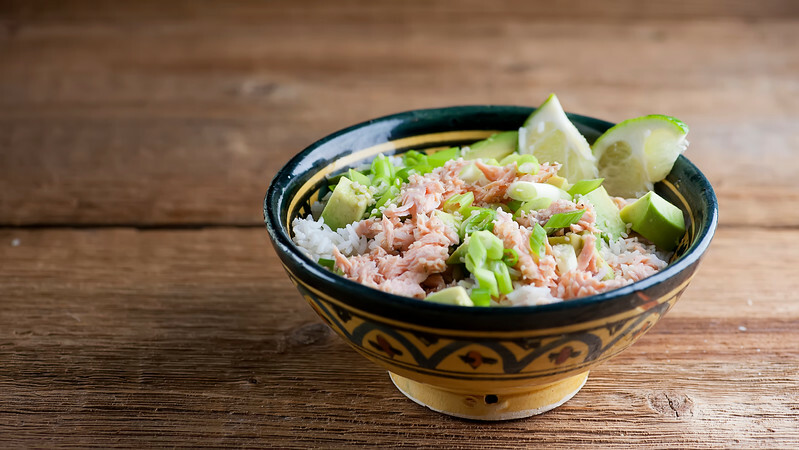 Tender flaky roasted salmon, buttery avocado, sassy scallions and a lime and mustard dressing, all nestled in a bed of rice and served in your favorite bowl. Are you ready for some easy, healthy comfort food deliciousness? In a bowl? Let’s make it!This past week I was especially in need of comfort food in a bowl because this happened. Yep. 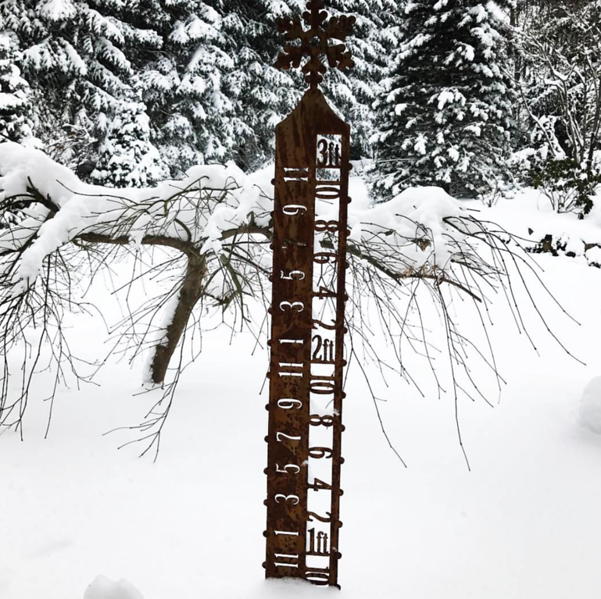 Ten inches of snow, according to my trusty snow gauge. The minute the first snowflake falls, the dog and I head for the family room and the fireplace and we don’t leave until it is over. It snowed almost all the live-long day, and I only ventured out when it was over to take this picture of the steps to my back yard garden gate (see it in the amidst the snow?) 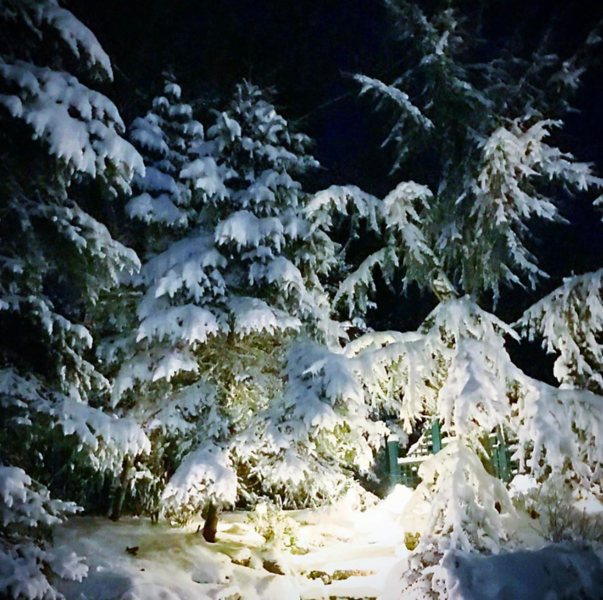 because it looked like Narnia and I had to memorialize that. FOR NARNIA! Then I ran back inside to assume my position on the sofa under a blanket by the fireplace. But sooner or later, one has to eat dinner, and when you really, really don’t want to come out from under your blanket or leave the room with the fireplace, dinner is a lot easier when you eat it out of a bowl. Trust me. I have put much research into this. So here’s this one goes: you get a nice boneless salmon filet, which is what we were buying while everyone else was getting milk and batteries, because everyone has their own opinions about what they don’t want to be caught without during a blizzard. Roast the salmon with a little olive oil and salt and pepper until it is just cooked through, and then use two forks to pull it apart into flakes. Meantime, shake up a quick mixture of lime juice, mustard and a few other things into a sassy little dressing. Cook up some rice – white or brown rice, your choice. Once all that is done, all that’s left to do is assemble your scrumptious salmon bowls. Start with a layer of the rice – I like to toss my rice with a little mirin, which is rice wine and which you can usually find in the supermarket near the soy sauce and other Asian ingredients. You can skip this step if you want, but I love the taste it gives the rice. You can also substitute sherry for mirin if you want to. Now just layer on the flaked salmon, some avocado and scallions, and drizzle the whole thing with the dressing. Scatter some sesame seeds on top and your bowl is ready to rock. I highly recommend it for sofa and under the blanket eating. Good and good for you! Put all dressing ingredients into a jar, close the lid tightly and shake shake shake until well mixed. Preheat oven to 425. Line a rimmed baking dish with parchment or foil. Place salmon filet on the baking dish, brush on olive oil, sprinkle with salt and pepper and roast for 15 minutes. When the salmon is done, pull it into flakes, using two forks to gently pull it apart. Toss the rice with the mirin, and them you are ready to assemble the bowls! Divide rice among two bowls. Top each with half the salmon, half the avocado and half the scallions. Give the dressing one more shake and then drizzle it over the top of the bowls. Scatter sesame seeds on top and serve with lime wedges. Such pretty pics of the snow Kate! I always find eating from a bowl so comforting too. 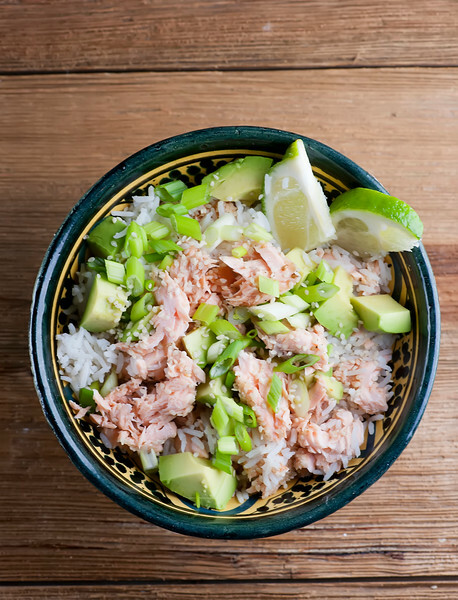 The flavors going on in this salmon rice bowl sound perfect. I love the dressing and the addition of the avocado. I’m obsessed with it right now. Adding this to our menu soon! Food out of a bowl just seems to taste better for some reason! I’m loving this salmon bowl, Kate! So much deliciousness going on here. Such great comfort food! Supper in a bowl is definitely one of the best things ever!! And salmon happens to be one of my favourite types of seafood so this is right up my alley! Those snow pics are gorgeous!! This looks amazing, Kate! Also, we’ve totally been getting hit by snow like crazy here in Maine. It’s officially a blizzard! Hoping you and yours stay safe and warm this week. xoxo Pinned, of course! way to spend spare time ..so I am half way there and looking forward to this for dinner! Thanks for ANOTHER great idea!!! Hi Kate. In the recipe for the salmon bowl, the first ingredient reads: 1/4 cup rice or white wine vinegar- I think I know what you mean, but would rather have you explain. Do you mind? Thanks. Duh! I should have known better. Thanks for the fix! I must say that as wonderful as the salmon bowl looks I’m raring to make the Pastina. What a perfect recipe for me! I’ve ordered a box from Amazon. What did I do before? That pastina is one of my all time faves!! Enjoy!! Salmon is absolutely positively my favorite food on the face of the planet. I cannot live without it. NOPE! not at all! You know I love me some healthy comfort food and I’ve been ALL about the bowls recently! This salmon + rice version is pinned and going on the menu!